Over several years, the Austrian artist Nikolaus Korab sought out vacant buildings across Austria with his large-format camera. In strikingly stripped-down images, accompanied by carefully selected literary quotes, he looks into the extent to which darkness can be fathomed in a photograph—from the reduced spatial dimensions to the picture’s two-dimensional black surface. 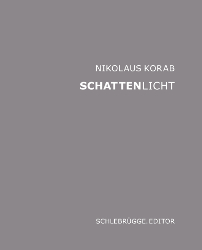 While black has long stood for a departure from the real world, threats to life and limb, and the uncanny, Korab manages to give to the ever-present light back its critical value: life-giving and form-revealing—a reference to openness. Nikolaus Korab, born 1963, lives in Vienna and Lower Austria. He studied at Film Academy Vienna, was camera assistant to Walter Kindler and Wolfgang Hackl and has lectured at the University of Applied Arts Vienna. Since 2009 he lectures at Vienna Art School.